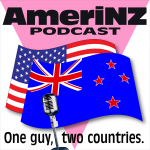 » AmeriNZ 338 – Still more changes AmeriNZ Podcast: One guy, two countries. Despite a few obstacles, I’m back. Again. Again. Well, it was one month sooner this time, so, small victories, right?! I start out talking about a new baby, then changes to this podcast and all things AmeriNZ, and to me, too. Lots of things are changing! I have details. 1 user commented in " AmeriNZ 338 – Still more changes "
I MAY have been one of those folks who never quite understood the need for your delineations, so I’m good with this.